Do you remember this cereal? 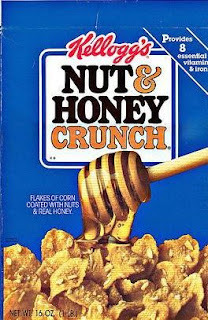 I loved Nut & Honey Crunch as a kid. I have fond memories of playing with our old neighbor friends and eating it with them for breakfast. One of us would say, "what's going on?" 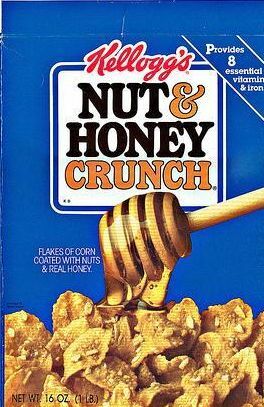 and the other would reply, "nut & honey" (nothin' honey). Okay, random. Well, one day, I went to the store to get some and couldn't find it. It was no where. Every time I'm in the cereal aisle I look for it. I guess they stopped making it!? But how could this be so? It was so good. Hmm. 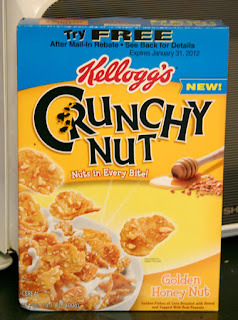 I'm on to you Kellogg's! Nut & Honey Crunch vs. Crunchy Nut - Golden Honey Nut. I was pretty sure it had to be the same cereal but with a different name and fancy new packaging. I bought it, made a huge bowl and am here to report that it is indeed the same. I think. If not, it's close enough for me! hi, friend! you won the i sew lucky giveaway! congrats :) would you email me at takeheartblog (at) hotmail (dot) com and i will get you hooked up with april so you can pick out your sweet little owl! thanks! Ack, I saw that this morning and wondered if I was the lesley!! Emailing you now! hahah! You have to wonder how many products they do that with when we don't even notice! So funny! YES!!!! You are totally right! Love (both) of those cereals!